This comes from the "where has it been all my life?" department. 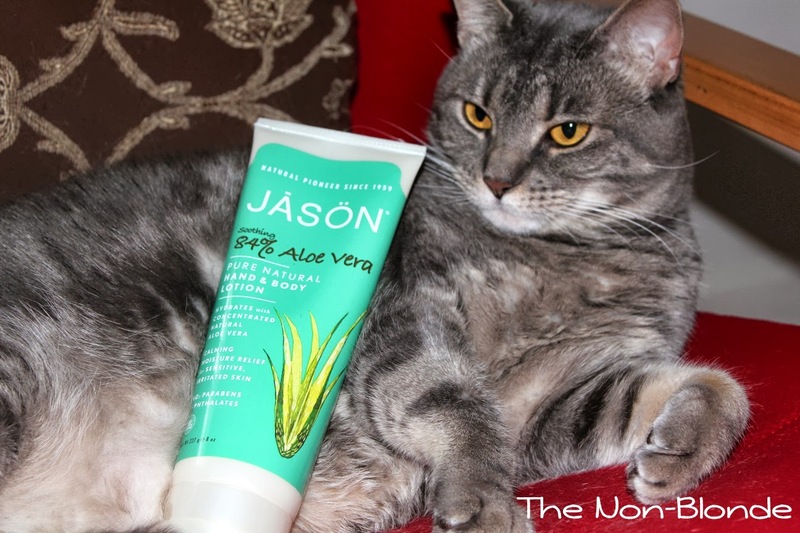 The humble looking tube of Jason Natural Cosmetics Soothing 84% Aloe Vera Hand & Body Lotion has been saving my arms and legs lately, helping me deal with everything from abrasive products, mosquito bites, and rawness due to over-swatching (and removing of said swatches). It's brilliant, really: I've always been a heavy user of pure aloe vera gel, but the texture of the raw thing is on the sticky side. A good lotion that spreads easily and sinks into the skin quickly is a much more practical solution for hands and limbs, and that's what I get from Jason. An 84% aloe vera content is a wonderful percentage that makes a real difference for used and abused dry skin such as mine. I've been applying this Jason lotion after washing and scrubbing my hands, when carrying a heavy shopping nag left the skin on my right arm dry, raw, and flaking, and-- as I mentioned above--between and after swatching makeup on my arm. The lotion soothes upon contact, moisturizes, and leaves the skin feeling softer and healthier. It's not a substitute for the heavy nourishing I need (that's what shea butter and body oils are for), but it solves a particular problem that I deal with every single day. Aloe Barbadensis Leaf Juice, Aqua (Water), Caprylic/Capric Triglyceride, Glyceryl Stearate SE, Cetyl Alcohol, Stearyl Alcohol, Glycerin, Potassium Cetyl Phosphate, Ethylhexyl Palmitate, Dimethicone, Helianthus Annuus (Sunflower) Seed Oil , Persea Gratissima (Avocado) Oil, Chamomilla Recutita (Matricaria) Flower Extract, Camellia Sinensis Leaf Extract, Panax Ginseng Root Extract, Ascorbic Acid, Panthenol, Retinyl Palmitate, Tocopheryl Acetate, Allantoin, Citric Acid, Xanthan Gum, Caprylyl Glycol, Ethylhexylglycerin, Phenoxyethanol, Potassium Sorbate, Sodium Benzoate, Amyl Cinnamal, Benzyl Benzoate, Benzyl Salicylate, Butylphenyl Methylpropional, Citral, Geraniol, Hexyl Cinnamal, Hydroxycitronellal, Limonene, Linalool, Fragrance (Parfum). Jason Natural Cosmetics Soothing 84% Aloe Vera Hand & Body Lotion ($6.97, 8oz) is available at Whole Foods, Wallgreens, and soap.com. The product for this review was sent by PR. Model: Josephine, who is naturally soft.